Do athletes really need compression socks and tights to boost performance? The popularity of wearing compression socks has increased among endurance athletes who hope for a performance boost and quicker recovery. Go to any organized long-distance run and you will see plenty of competitors wearing knee-high compression socks. The same kind of attire used by diabetics and airline pilots to avoid blood clots has become a popular item for competitive runners hoping the colorful garments will give them a performance boost, soothe sore muscles, or improve their recovery times. The benefits for use by those prone to deep vein thrombosis, a potentially serious condition that occurs when a blood clot forms in a vein, have been well-documented. But the jury is still out on how useful the knee-high socks are for runners. Ditto for compression tights. "Marketing has certainly helped compression socks tremendously, but science hasn't supported the claims," said Justin M. Stanek, an assistant professor at Illinois State University College of Applied Science and Technology. In 2015, Stanek looked at a number of studies that examined the effectiveness of the socks and determined that the results were inconclusive and that more research was needed. 6ABC meteorologist Cecily Tynan, seen here a few years ago at The Brandywine Bend Footrace, an eight-mile trail race in Chadds Ford. Tynan has worn compression socks for longer runs. Athletes will often seek out anything they think will help them, and perceptions may play into whether or not they feel they benefited, Stanek said. 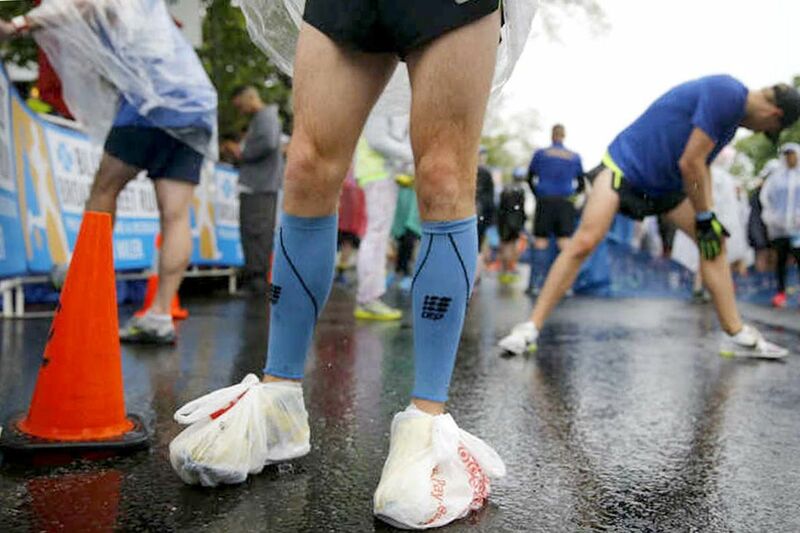 If an athlete is going to be cooped up for hours on a plane or in a car after a race and unable to get up and move around, wearing the socks could be a good idea, he said. There are other reasons to consider wearing the tight-fitting socks on flights. In general, women on oral birth control would benefit from using them, said Riyaz Bashir, professor at the Lewis Katz School of Medicine at Temple University. The medication comes with a higher risk of forming blood clots, he said. "There is very little downside to wearing a compression stocking," said Bashir. The important thing is to know if you are at higher-than-normal risk for forming blood clots. If you are, then it is worthwhile to use compression socks, he said. Anyone who isn't moving around — such as on a long flight — should be getting in some activity, such as flexing and extending the ankles to keep the blood flowing in the calves. The lack of evidence hasn't stopped runners from buying up the socks or leg sleeves, which start at the ankles and go up to the knees. "I think a lot of people were wearing it as fashion," said Bob Schwelm, owner of Bryn Mawr Running Co. He has tried the socks but didn't feel any difference. Runners who use them for injuries swear by them, he said. "I don't think there is a performance benefit, but if you have an injury it will help," he said. To be effective, runners should purchase medical-grade compression sleeves or socks with the tighter weave on the bottom, he said. They tend to run about $60. Men tend to favor black compression socks while women scoop up the more vibrant colors. Don't expect a performance boost, though. A study from the Ohio State University Wexner Medical Center concluded that although the tights greatly reduce muscle vibration, they don't reduce muscle fatigue. Runners achieved the same times with or without compression tights. The idea that tired runners may alter their form and put strain on their joints, increasing their risk of injury, didn't pan out, either. Experienced runners showed no more strain on their joints at the end of the training runs than at the beginning, the study showed. "There is nothing in this study that shows it's bad to wear compression tights," said lead researcher Ajit Chaudhari, associate professor of physical therapy, orthopedics, mechanical engineering, and biomedical engineering at Ohio State. But there might be something of a placebo effect: If runners think the tights help in long distances, the psychological boost may be enough to help them, he said in a statement. About 10 years ago Cecily Tynan, 6ABC meteorologist and former pro duathlete, had a recurring problem with her calves cramping near the end of distance races. She ruled out dehydration and finally decided to give compression socks a try. Whether it was because of increased blood flow or the socks just kept her legs warmer, Tynan said, her muscles didn't cramp. "I didn't know the reason," she said. "It just worked for me." She remembers posting a photo of her socks on Facebook shortly after adding them to her running wardrobe. People made fun of them. "Now you go to the races and everybody is wearing them, so they definitely caught on," said Tynan, who ran seven marathons, four of them under three hours. Tynan has competed in numerous triathlons and Broad Street Runs, but now she's running only shorter distances in order to spend more time on the sidelines of her children's soccer games. She still plans to wear the socks. "I do find they make a difference," she said. Thinking of trying a health app? Here’s what you need to know.